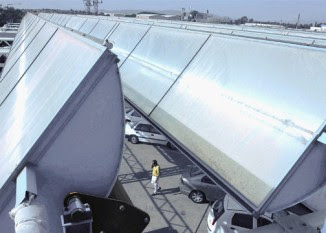 A worker stands between solar energy collectors at the Solel Solar Thermal Energy Plant in Beit Shemesh on May 20, 2008. TEL AVIV (JTA) -- From cutting-edge geothermal power deep underground to wind turbines and solar panels capturing energy from the sky above, foreign investors are pouring money into Israel's growing clean tech sector. And it's not just Jews. "Every day I get calls from people asking for opportunities to invest in clean technologies in Israel," said Michael Granoff, president of the New York-based Maniv Energy Capital and an investor in Project Better Place, the company working to make Israel a testing ground for an electric car. Clean tech, a catch-all term for emerging technologies focused on renewable and more efficient energy consumption, is soaring in Israel. A wave of new start-ups, academic research projects and new venture capital funds are focusing on the industry, and multinational corporations such as the Coca-Cola Co. and General Electric are scouting out new technologies here. Fueling the interest in environmentally friendly clean-tech solutions are skyrocketing oil prices, growing concerns about global warming and a push for sustainable solutions to the world’s energy problems. Investing in Israel's expertise may not only make good business sense but benefit the worldwide quest for cleaner, greener energy alternatives. It also may constitute an opportunity to bolster Israel’s international reputation by linking the Jewish state with green innovation. Jonathan Shapira, a recent American law school graduate who writes a blog on clean-tech investment in Israel, says Diaspora Jews can play an essential role by becoming either consumers of or investors in Israeli technologies. The imperative for developing alternative energy sources is particularly acute for Israel because its enemies’ strength derives in large part from the world’s dependence on their oil resources. Rosenblatt, who also runs an investment fund in New York, where he lives, said his investment in Arava Power is a Jewish venture as well. "This is about clean energy, but it's also about Jewish roots and what I can do to express it and where I personally have value to add,” he told JTA. In Herzliya, three American immigrants in their 30s have created the first venture capital firm to target the Israeli clean-tech market, Israel Cleantech Ventures. They recently raised $75 million for their debut fund, exceeding the $60 million they originally set out to raise. Glen Schwaber, one of the firm's partners, said enthusiasm among investors for Israeli clean tech reflects Israel’s growing reputation as a potential incubator for new technologies that is buoyed by the country's high-tech success stories. The Jewish state is beginning to capitalize on its experience in such fields as solar thermal technology, wastewater recycling and desalination. Until recently, Israel had the world’s only large-scale desalination plant, off the coast of Ashkelon. Now countries such as China are building them. "Israel is a great country to beta test some of these new technologies because it is a microcosm of the world's needs: shortages of water, a large transportation fleet on per-capita basis, and an abundance of solar energy potential," said Schwaber, 38, who made aliyah from Boston. Among Cleantech Ventures' investors are some big names in Jewish philanthropy, including the families of Edgar Bronfman and Stacy Schusterman. Schusterman, CEO of the Samson Investment Co., a private oil and gas company based in Tulsa, Okla., said she sees her investments in Israeli clean-tech ventures, including Israel's electric car enterprise, as business, not philanthropy. "This is a business venture," she told JTA in a phone interview from Tulsa. "We saw this as an opportunity to leverage Israel's deep intellectual capital in an area we see as a burgeoning worldwide industry, and by investing it we would have the opportunity to create a hedge against our base business." Last month, the city of Los Angeles signed an agreement with Kinrot Incubator, a company located on the shores of the Sea of Galilee that helps entrepreneurs and researchers with water-based technological innovations. The deal will enable Israeli start-up companies to use water and power facilities in Los Angeles for pilot projects and to conduct joint research with the University of California, Los Angeles on water projects. Los Angeles is interested in using the Kinrot model to establish its own incubator for water-related technologies. Assaf Barnea, Kinrot's CEO, said that although the water market is not new, the hype over going green has given it a new shine in the eye of investors.